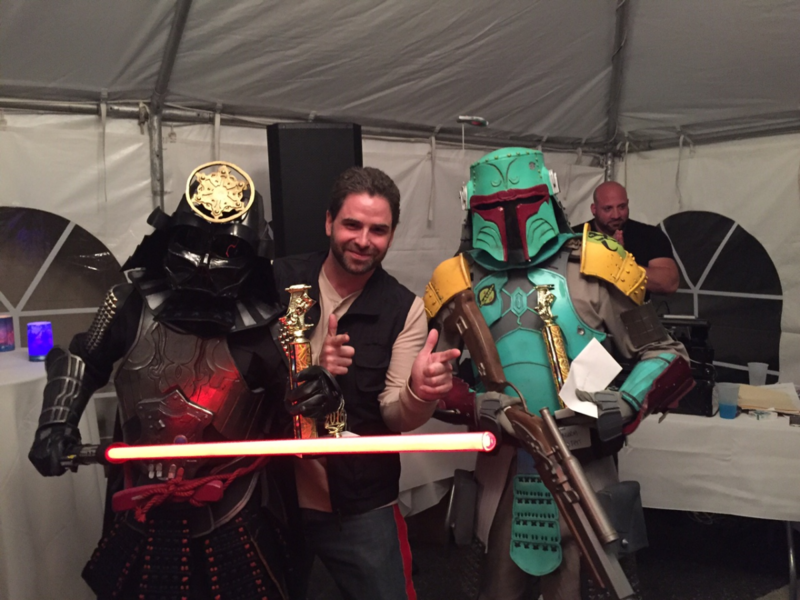 Blake Lichtenberger’s Samurai Boba Fett won the $300 award for Best Overall Cosplay. Look at the details in the handcrafted helmet! The work is utterly stunning, especially when you get up close. 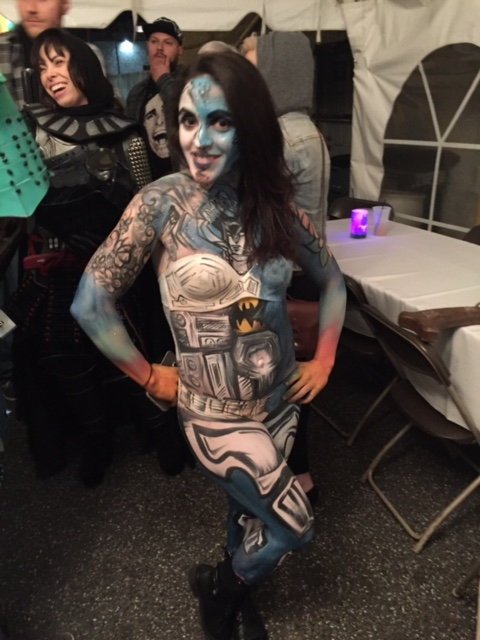 Equally impressive was the costume of Blake’s wife, Evelin Urcuyo, who took the $200 prize as Samurai Darth Vader in the Out of This World category. Another amazing costume from two exceptionally nice people. You should definitely follow their cosplay features on Facebook! 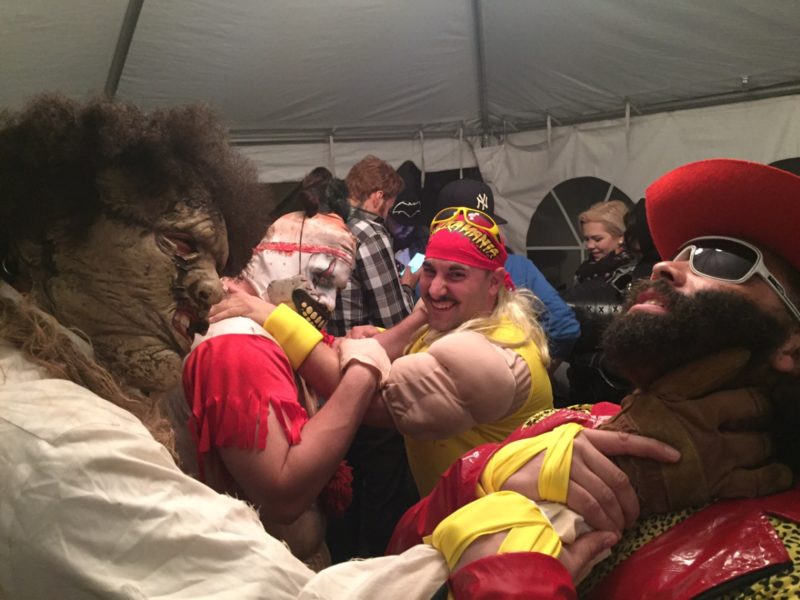 Teddy Schools as “Macho Man” Randy Savage took home $200 for Sexiest Cosplay Outfit. Yes, ladies...that beard is real! See why he won sexiest? Teddy is working on a Shawn Michaels costume next, which may win him future awards in the category! 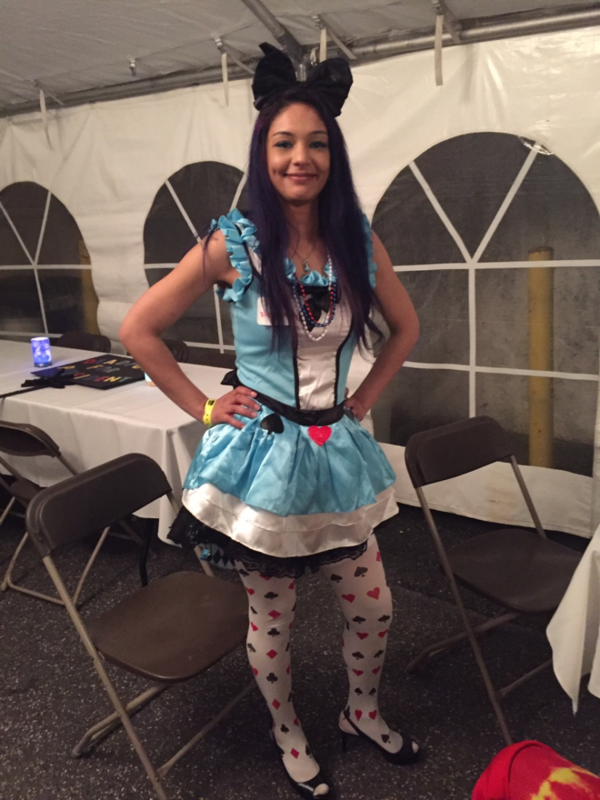 Tabitha Santiago in a lovely Alice in Wonderland costume took home $200 for Best Sci-Fi/Horror/Fantasy Cosplay Outfit. Alice is iconic, and Tabitha pulled off the assured toughness the character demands. Hector Vasquez as Deadpool won $200 for Best Comic Book Based. Deadpool may be the Merc With the Mouth, but crazy energy and sign work put this outfit over the top! Judging was carried out by realtor Glen Kelly, radio host Marc Berman, Iron Room owner Mark Callazzo, SNJ Today entertainment correspondent Jax Loder, and Chef Manda Palomino. Each of the judges and luminaries mingled with the guests and made everyone feel like a big wig. Chef Manda also did a brilliant job as the master of ceremonies. She interacted with everyone in attendance and was the life of the party. Would you expect anything less from a person that survived Hell’s Kitchen? Obviously, location is an important piece to the success of any party, and the Iron Room, just a short drive from the Convention Center, was a fine backdrop for the event. Before the party, I enjoyed a sumptuous dinner that included a beautiful selection of Tapas. I enjoyed Udon Mac & Cheese, Steak Tartare, Thick Cut Bacon, and finished with the Boardwalk Funnel Cake Waffle. Most may go to AC to gamble, but I'm telling you, it's worth the trip just to eat chef Kevin Cronin’s creations. 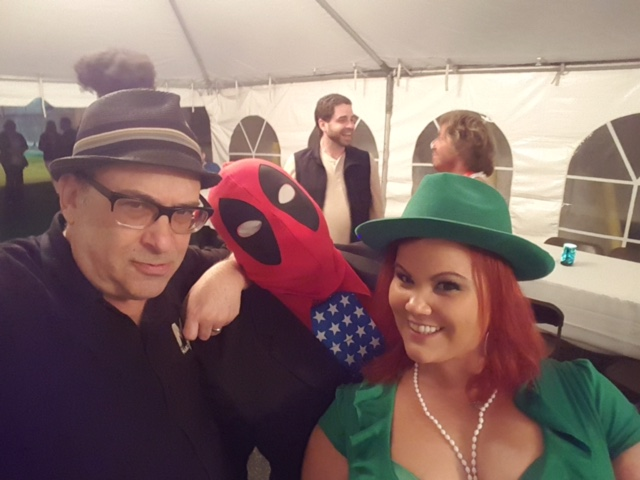 During the event, there were tasty party foods available as well as some themed mixed drinks like the Stan The Man or the Hank McCoy. Little touches like that really pulled the party together. If you're a reader of Critical Blast’s Cheap Pops column, you'll know all about WrestlePro. As an awesome treat, partiers had a chance to mingle--or be chased by--the terrifying Giant Leather and creepy Gambles the Clown. Let's not forget, the coolest lifeguard in the biz, Dylan Stiffwood, tried to keep order with the monsters. All three men added a tremendous ambiance to the evening. You should check out more about WrestlePro on their website or head to Keyport, NJ on June 11th for a live taste of the action! 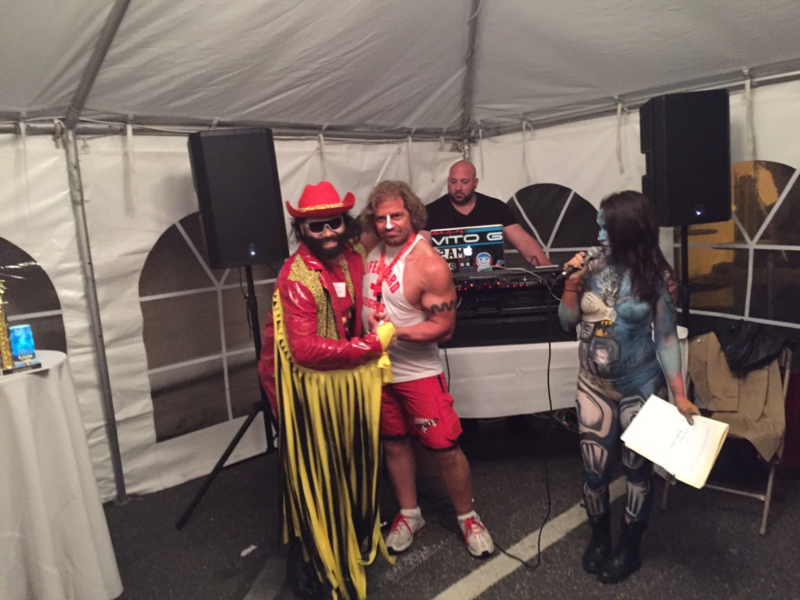 Special shoutout goes to Chad Minnes who dressed as Hulk Hogan and partied with us late into the night. Chad owns Lacey Cleaning, and this was his initial foray in party organizing. I'm excited to see what's next for his planning endeavor called Geek Time Entertainment. One thing is for sure, it's going to be a lot of fun! For more information and pictures of the event, check out the event page. You can get the latest from Geek Time Entertainment on Facebook.